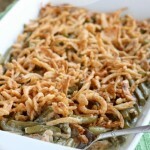 Southwestern Turkey Pot Pie - Dessert Now, Dinner Later! This post brought to you by Swanson®. All opinions and text are 100% mine. Thanksgiving came and went, but I hope you still have some turkey leftovers hiding in your freezer! 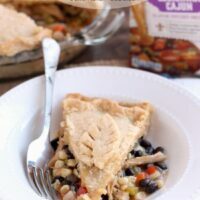 The term “leftovers” kind of has a negative connotation, but believe me, leftovers never tasted as good, or gourmet as they do in this Southwestern Turkey Pot Pie! Who said leftovers have to be re-heated and eaten the same way they were originally created? Not in my house, no way! 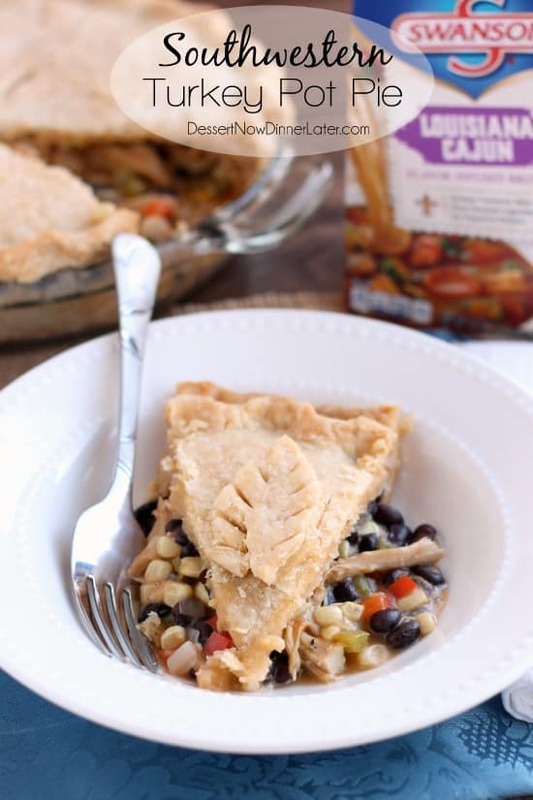 This Southwestern Turkey Pot Pie has tender sweet corn, plump black beans, and vibrant bell peppers combined with shredded or cubed turkey in a Cajun style gravy. One of my favorite parts about this recipe is playing with the piecrust. I have a tutorial here on my blog that explains the “how’s” and “why’s” to piecrust, so you might want to check that out if piecrust is something that intimidates you. Piecrust can show off some skill, but it makes homemade pot pies that much more comforting! Actually, when I make pies for Thanksgiving, I make extra crust and keep it in the fridge just so I can make potpie with the leftovers! The aromas from this potpie are incredible! You sauté the onions, peppers, and garlic in some butter, add flour to form a roux, then you pour in Swanson® Louisiana Cajun Flavor Infused Broth, and that’s when things start smelling wonderful! The broth really compliments the whole dish due to the flavor combinations of green bell pepper, celery, onion, garlic and Cajun seasonings. 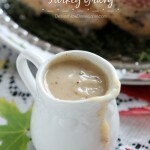 Add some cayenne pepper or hot sauce for an extra kick in this gravy! 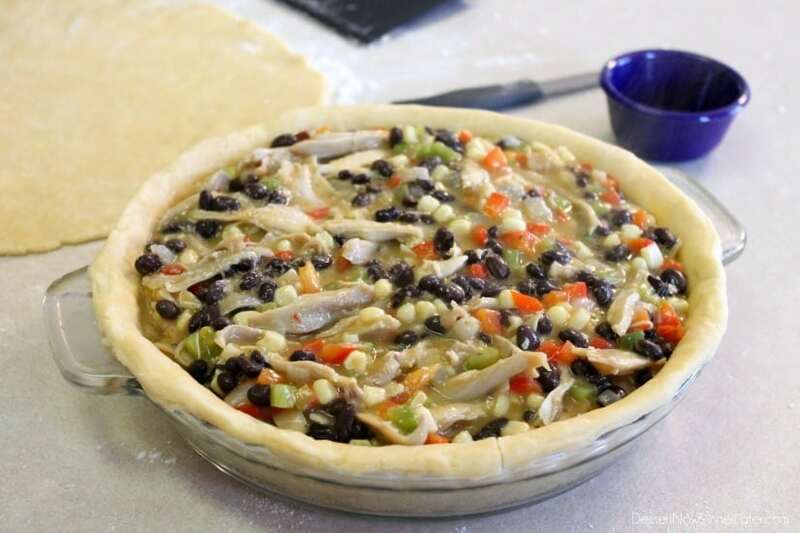 Once the gravy thickens up really nice, you add in your beans, corn, and turkey leftovers that are being “made-over” in this Southwestern Turkey Pot Pie. Now these are leftovers you want to eat, right?! Fill your piecrust, add the top, cut a few slits for ventilation and add a couple of cute decorations for fun. I like to do little leafs for fall. Bake it all up and you are enjoying Thanksgiving leftovers in style! It’s a whole new gourmet meal the entire family will enjoy! 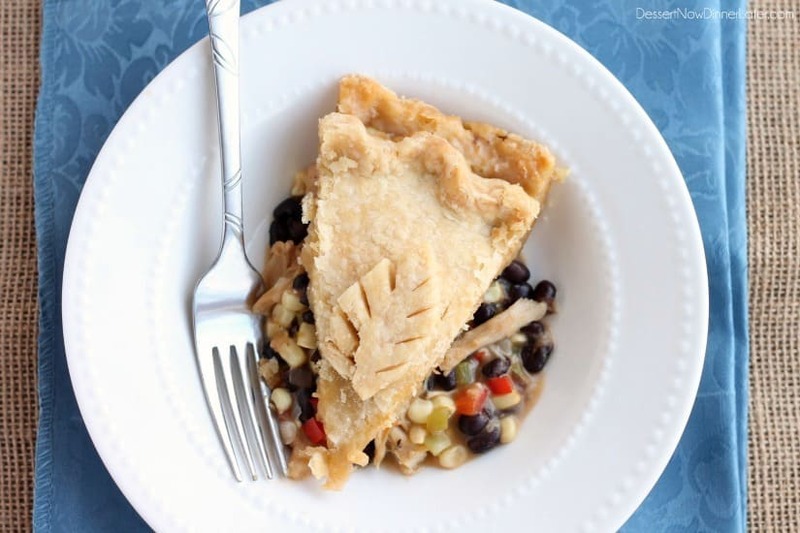 This potpie is so delicious and comforting, you are going to love it! Prepare pie crust. Divide the dough in half. 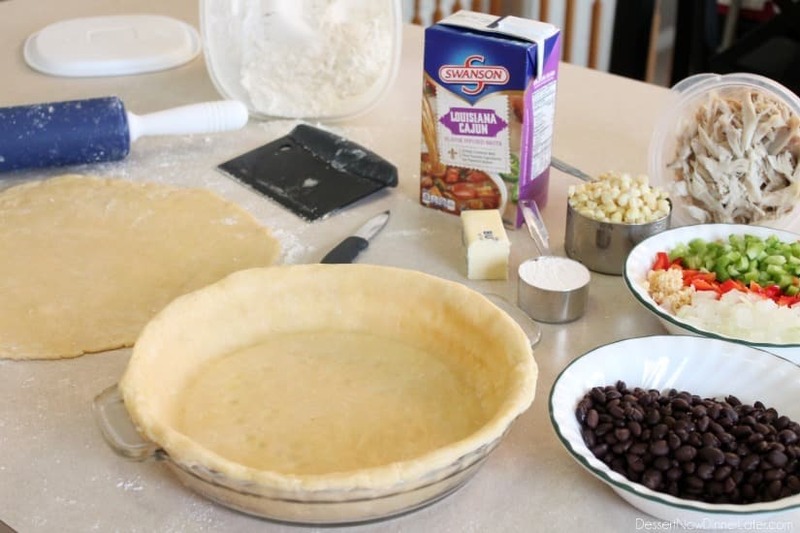 Roll each half into a circle and place one half inside a pie dish. Cut off excess crust around the edges. Roll out the other half into a circle and save it for the top. Keep both crusts covered and cool until ready to use. In a large saucepan, melt the butter and sauté the onion, bell peppers, and garlic for several minutes until the onion is translucent. Add the flour to soak up the liquid from the vegetables and cook for one minute. 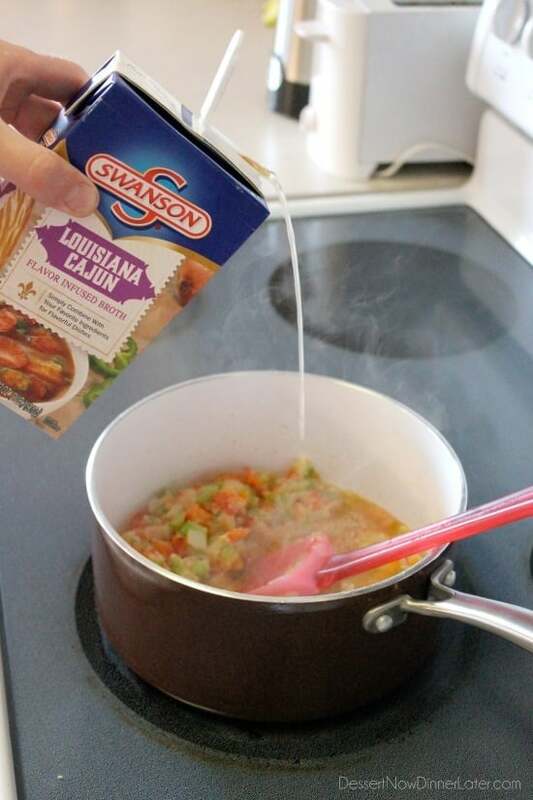 Pour in the Swanson® Louisiana Cajun Broth while stirring briskly until the mixture thickens. Taste and adjust seasonings with salt, pepper, and cayenne pepper or hot sauce to desired heat. 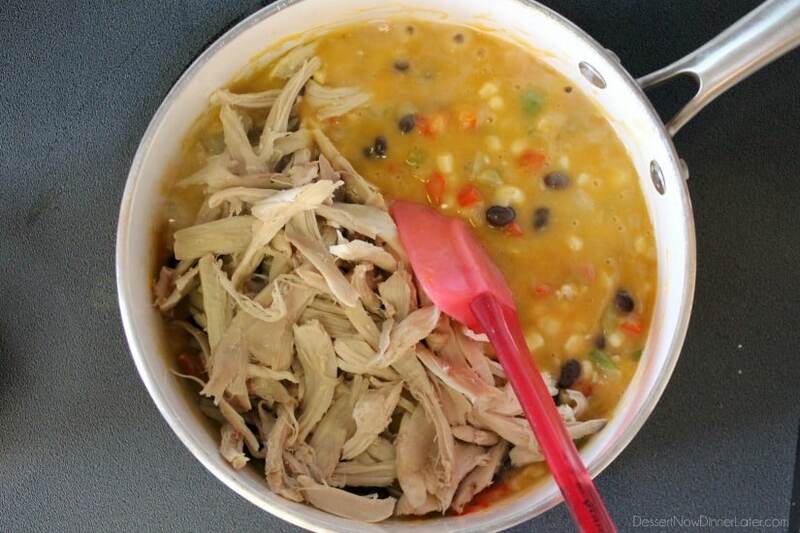 Add the black beans, corn, and turkey. Stir until heated through. Pour mixture into prepared piecrust. Dip your finger in some water and dab the edges of the crust to lightly wet it. Place the top crust on and press the edges to seal the two crusts together. Cut off excess crust, crimp edges, cut slits for ventilation, and use the excess crust to cut out decorations with; I made leafs and dabbed them on with a little water. Bake at 350 degrees Fahrenheit for 60 minutes or until crust is golden and filling is bubbling. *You may want to place a baking sheet on the rack underneath the pie to catch any spills. This blog post is sponsored by Swanson®. I’m not too big a fan of the usual cream-laden chicken pot pies, but a turkey-filled Mexican one?! I’m so in! Dying over how perfectly flaky your crust looks! 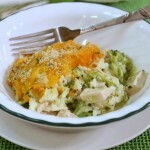 Yeah, this was a great twist to the usual cream pot pies! We really enjoyed it! Thanks Sarah! I love the spin you did on this pot pie! It’s so different than the traditional pot pies I’m used to seeing. Right up my alley! Thanks Jen, very different, but a good different! This is such a great idea, Amber! 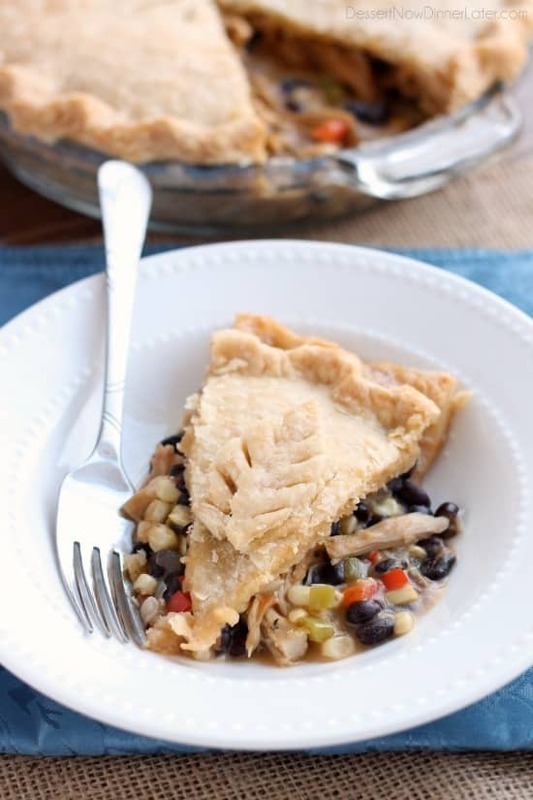 I love pot pies and the Southwestern flavors sound amazing with the turkey and flaky pie crust! Thanks Kelly! It turned out quite nice! Oh, my, I wish I was your guest for dinner when you served this! 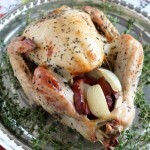 I’m making this for sure–with chicken and turkey! I would have been happy to share Teresa! I hope you like it! Just started a new blog for leftover Food Recipes and Ideas in the UK sharing ideas from around the world. This looks like a tasty way to serve leftover Xmas Turkey for our UK Audience. Would love to share more recipes from here. Thanks! You may use one photo and a link to my blog for the full recipe, or re-create the recipe and use photos of your own. Enjoy!